TWO MONTHS AGO, the New Yorker ran a posthumous essay by the brilliant author and physician, Oliver Sacks, in which he expressed concern for our rapidly changing world. “I worry more about the subtle, pervasive draining out of meaning, of intimate contact, from our society and our culture,” he wrote. Sacks was old enough to be my grandfather when he died at the age of 82 in 2015. His warning struck me as profound, but also futile. Technology has already taken over, there’s no turning back; it’s been part of my life as long as I can remember. Every day, professionally and personally, I spend more time engaging with my smartphone than another human being. That said, I have sometimes wondered how technology has affected my ability to properly care for my patients. I learned how to be a diagnostician by clicking through graphs and tables, and accessing an astounding array of charts and historical information. Just by looking at my computer, I can find a patient’s documented temperature, respiratory rate, heart rate, and blood pressure, and immediately know whether I’m dealing with someone who is sort of sick or very sick. I’ve spent plenty of days in the hospital feeling more like a data analyst than a healer. There have been many times when I thought I might have the diagnosis before seeing the human being in question. Like many other residents, I sometimes think of time spent in the exam room as “extra;” information gleaned from the actual patient does change our data-driven diagnoses but not all the time. But what if the data is creating diagnostic bias? More importantly, is all this frenzy to enter and access data harming our patients? A few weeks after reading Sacks’s essay, I was forced to confront the meaning of his warning. That was the day our computers went blank. When I arrived at the Boston hospital where I am a resident, instead of hearing the clatter of typing, I was met with confused looks. My morning routine usually involves an uninterrupted computer session checking the electronic medical records (EMR) for overnight events, reviewing morning labs, putting in any early orders, and typing daily progress notes. Suddenly, we had nothing to guide us. My colleagues and I had never practiced medicine without instant access to mountains of data. It was like flying without instruments. We were wholly unprepared. Our department head soon arrived — several decades older than us, he was half-amused by our predicament. He explained the procedure we would follow: We would hand-write all orders and notes and directly communicate them to each nurse. We would have to see new patients without our usual array of vital signs, morning labs, or imaging results. In my head, it felt like the hospital was falling apart. Would we make it through the day? And yet, I also felt unexpected relief at not having to worry about all that data, for once. My first patient was a heavy-set man who had come in the night before with chest pain. I’d read about his case on my way to work, and knew from his cardiac troponin levels (used to assess muscle damage in the heart) that the chance that this was anything close to a heart attack was very low. I was almost certain that the only thing he needed was close follow-up with a cardiologist. What I couldn’t have known was how terrified this man was. He asked me nervously, “Doc, am I going to get better? Did I have a heart attack?” Without the EMR system demanding my attention, I turned to him as one human being to another. I reassured him that he was okay; that he had not had a heart attack. I told him that I cared about him. Clinically, none of this was necessary -- my patient could have walked out of the hospital before I even saw him and he would have been fine. But I realized there is something more to medicine than people just being fine. In each exam room that day, I relied on my eyes, ears, hands, and stethoscope. During patient encounters, I understood that there is more to being a doctor than making sure organs are not dying. With the EMR down, I could tap more deeply into the human element both because I had time, and because I felt psychologically unburdened by the incessant demands of technology. For some patients, I even found that my diagnosis changed from what I had initially concluded based on the overnight admission note. A woman who was originally billed as suffering from pneumonia was more likely experiencing a flare up of asthma. I knew this by the way she was breathing — the characteristic of the wheezes I could clearly hear through my stethoscope. I felt far less strongly based on what I heard that she needed antibiotics, and ended up discontinuing them later that day. Against all expectations, we finished rounds 30 minutes ahead of schedule, yet we had spent more time with each patient. This shocked me, but it shouldn’t have. 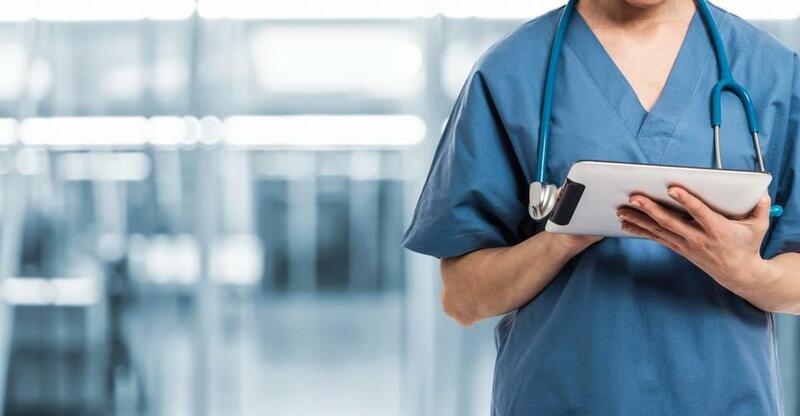 A recent study found that medical residents spend 5.38 hours per day on the electronic medical record system — and the majority of that time is spent reviewing information rather than producing new data. DOCTORS HAVE DEVELOPED an unhealthy dependency on the EMR system. As physicians-in-training, we operate under immense pressure to know all of the data, which is overwhelming and nearly inhuman. If a patient forgets to tell me something during the interview, that is excusable. But if I miss a data point that was in the computer, I am ultimately responsible. What’s worse, the system has interfered with our ability to provide whole care. Having to type anything while talking to someone in pain or panicking is inherently obstructive. The abundance of screens forces us to break eye contact; technology dilutes our attention to our patients and makes conversations stop-and-go rather than fluid and natural. It’s like trying to talk to someone at dinner while they constantly text on their phone between each sentence. No patients were harmed during the five hours that our system was down. But when doctors are half-listening and half typing-and-clicking, are patients losing something that they should not be? I became a doctor because I wanted to spend my time with people. I never imagined that most of my day would be spent behind a screen, with only a few rushed minutes at the bedside. A day without the EMR made me realize that doctors must resist the tendency to be overtaken by the machine. Many of the answers are right in front of us, within the patient. To become healers, then, we must first become human.